North Carolina farmers plant soybeans in all 100 counties in the state from the mountains to the sea. At 1.6 million acres in an average year, soybeans have the biggest footprint of any crop in the state. In a good year, the crop is worth as much as $800 million to farmers. Because soybeans work well in rotation with other crops like tobacco, and can be planted in the same field in the same year following the winter wheat crop, it is a very popular crop with farmers. 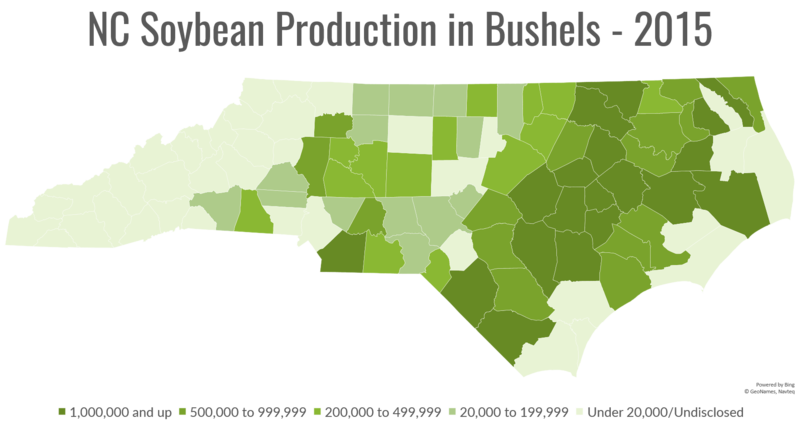 Most soybean acres in North Carolina are in the eastern part of the state in the coastal plain. Leading soybean counties include Robeson, Beaufort, Pitt, Sampson, Pasquotank, Wayne, Duplin and Johnston counties. Drought, heat, insects and weeds are the biggest pests of soybeans in North Carolina and farmers spend large amounts of resources battling these pests. North Carolina’s soils and climates are varied so soybean yield varies at different locations in the state or even in a single county. Scientists have made great strides in increasing the soybean’s native resistance to drought and heat stress. Farmers have adapted technologies and techniques that help them fight insects and weeds without harming the soil, the water and the wildlife. This makes soybeans a very affordable and manageable crop for farmers and one that is good for the state and its natural environment.